TACO BELL ARENA ON OCTOBER 11TH, 2018! Tickets On Sale Friday, May 25th at 10am. NASHVILLE, Tenn. – May 14, 2018 –Multi-platinum selling and GRAMMY® winning group Casting Crowns will hit the road this fall for the final leg of its hugely successful "The Very Next Thing" Tour, featuring special guests I AM THEY. ͞The Very Next Thing͟ Tour has hit 130 major markets since Fall 2016, resulting in some of the most successful shows of Casting Crowns͛ career. With multiple sold-out performances and an overall attendance topping 512,000, ͞The Very Next Thing͟ Tour has become the most attended Crowns tour since 2008. Presented by Compassion International, ͞The Very Next Thing͟ Tour supports Casting Crowns͛ current studio album, The Very Next Thing (Beach Street/Reunion). This marks the group's 15th release and eighth studio album since the label debut release in 2003. With more than 10 million records sold, Casting Crowns has held the position of Billboard͛s top-selling act in Christian music since 2007. Casting Crowns continues to impact audiences with their powerful live shows, having performed for more than six million fans. The group͛s summer schedule includes upcoming performances at more than 20 fairs and festivals across the country. In addition, the band just received its seventh GRAMMY Award nomination and is crossed over a milestone of more than 100,000 child sponsorships generated through Casting Crowns͛ concerts. For more information on ͞The Very Next Thing͟ Tour, visit www.CastingCrowns.com. Prolific CCM band Casting Crowns has achieved sales milestones including one RIAA 2x multi-Platinum album, four RIAA Platinum albums, two RIAA Platinum DVDs, seven RIAA Gold albums, four Gold DVDs, one RIAA Platinum certified single and five RIAA Gold certified digital singles. The band currently holds the position as Billboard͛s top-selling act in Christian music since 2007. 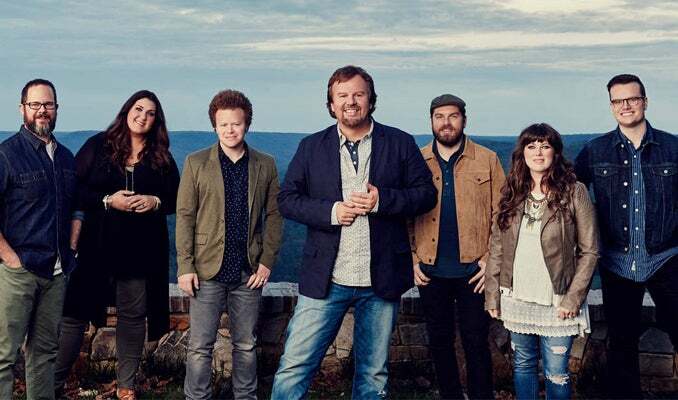 Casting Crowns has also been honored with four American Music Awards (out of seven total nominations), a GRAMMY Award for its 2005 album Lifesong, and seven GRAMMY nominations. In addition, the group has garnered 17 GMA Dove Awards and two Billboard Music Awards from 11 total Billboard Music Award nominations. Casting Crowns͛ seven band members all remain active in student ministry in the Atlanta area and tour according to their local church commitments. Serving his 25 plus years in youth ministry, lead singer/songwriter Mark Hall maintains his role as the student pastor at Eagle͛s Landing First Baptist Church in Atlanta. For more information, visit www.castingcrowns.com. I AM THEY made their national debut on Essential Records in 2015 with their self-titled album, which produced the group͛s lead single, ͞From The Day.͟ Abbie Parker (vocals/harmonium), Jon McConnell (vocals/guitar/keys), Matt Hein (vocals/guitar/mandolin), Justin Shinn (keys/banjo) and Sara Palmer (drums) make up I AM THEY, whose name is inspired from John 17 where Jesus refers to his disciples as ͚they͛. In their short career, I AM THEY has already made their mark in the Christian music arena, having opened for Matthew West, Matt Maher, Tenth Avenue North, Brandon Heath and Big Daddy Weave, to name a few. The band is preparing for the release of their second studio album, Trial & Triumph, slated to drop in March of 2018. For more information, visit www.iamtheyband.com. Compassion International is a Christian child development organization that works to release children from poverty in Jesus͛ name. Compassion revolutionized the fight against global poverty by working exclusively with the Church to lift children out of spiritual, economic, social and physical poverty. Compassion partners with more than 7,000 churches in 26 countries to deliver its holistic child development program to over 1.9 million babies, children and young adults. It is the only child sponsorship program to be validated through independent, empirical research. For more information, visit www.compassion.com. Ticket Info Tickets on sale now! Purchase online via ticketmaster.com, in-person at our Box Office or over-the-phone (208) 426-1480.